Reposting cause it is in fact important. On Friday, millions of people waited for hours in line to vote in Iran's Presidential election. Later that night, as votes came in, Mousavi was alerted that he was winning by a two-thirds margin. Then there was a change. Suddenly, it was Ahmedinejad who had 68% of the vote - in areas which have been firmly against his political party, he overwhelmingly won. 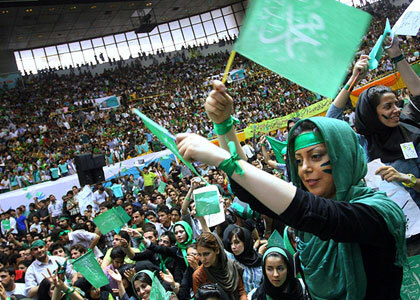 Within three hours, millions of votes were supposedly counted - the victor was Ahmedinejad. Immediately fraud was suspected - there was no way he could have won by this great a margin with such oppposition. Since then, reports have been coming in of burned ballots, or in some cases numbers being given without any being counted at all. None of this is confirmed, but what happened next seems to do the trick. 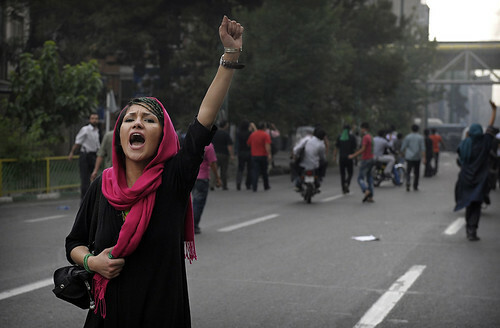 The people of Iran took the streets and rooftops. They shout "Death to the dictator" and "Allah o akbar." They join together to protest. Peacefully. The police attack some, but they stay strong. Riots happen, and the shouting continues all night. Text messaging was disabled, as was satellite; websites which can spread information such as Twitter, Facebook, Youtube, and the BBC are blocked in the country. At five in the morning, Arabic speaking soldiers (the people of Iran speak Farsi) stormed a university in the capital city of Tehran. While sleeping in their dormitories, five students were killed. Others were wounded. These soldiers are thought to have been brought in by Ahmedinejad from Lebanon. Today, 192 of the university's faculty have resigned in protest. Mousavi requested that they government allow a peaceful rally to occur this morning - the request was denied. Many thought that it would not happen. 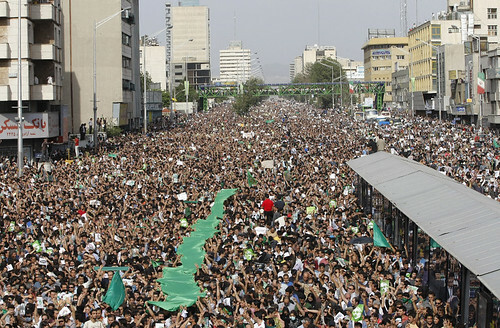 Nevertheless, first a few thousand people showed up in the streets of Tehran. At this point, it is estimated that 1 to 2 million people were there. (Personal note: I've heard reports that it might have been 3 million-- but nothing is confirmed at this point). Mousavi spoke on the top of a car. The police stood by. For a few hours, everything was peaceful. Right now, the same cannot be said. Reports of injuries, shootings, and killings are flooding the internet. Twitter has been an invaluable source - those in Iran who still know how to access it are updating regularly with picture evidence. Women are being brutally beat. 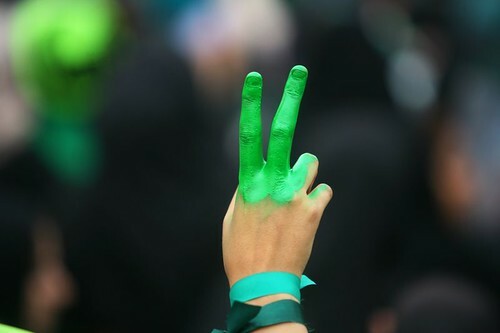 Tonight will be another night without rest for so many in Iran, no older than I. Tonight there is a Green Revolution. Here - _sober's twitpics. There's a lot of good twitpic photostreams of things going on. Tell the world how they have stolen our election. *ETA: I'll comment that, as regards to how Mousavi will get on with the West, nothing is firm or certain. However, in the likelihood that the incumbent cheated, it really doesn't matter what the numbers say-- he ought to be ousted for that criminality. If you would have won, and you cheat anyway, you still ought lose. Happy to say that Change_For_Iran is posting again.